My final post on Knoxville-based bakeries and cupcake shops is because of The Cupcakery. 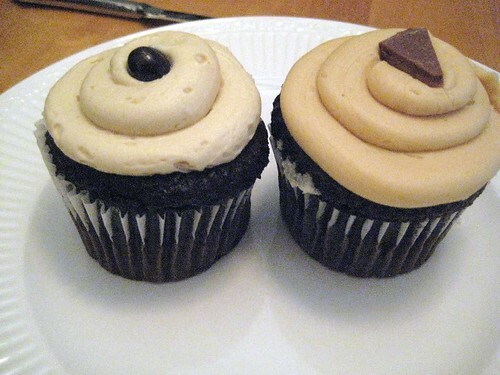 Your eyes are now feasting on the mocha cupcake, and the peanut butter cupcake. Clearly, my photograph only gives you the great look of these cupcakes, not the flavour. Both cupcakes were made with a dense, rich, moist, and beautiful chocolate cake. The mocha was topped with (duh), coffee flavoured buttercream that was silky, bright, and had a very fresh and clean coffee taste. And the coffee bean added just a bit of crunch (I could have gone for more coffee beans, but one will do!). The peanut butter buttercream was rich and decadent, slightly gooey in that perfect peanut buttery way, and again, the chocolate chunk on top added for a bit of texture change. Man… these are some phenomenal cupcakes. Go get some. NOW! Well, ok, get to Knoxville first, if you’re not already there…. Thanks for visiting our shop and for your great review. Hope you’ll visit us again!